The last of more than 38,000 fuel elements has been removed from the decommissioned Chapelcross nuclear plant in Dumfries and Galloway. 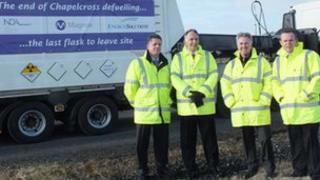 It completes the defuelling of all four reactors at the site near Annan. The plant ceased power generation in 2004 and its cooling towers were demolished in 2007. The operation has been completed four months ahead of the original target for the defuelling which was set at June this year. Magnox managing director Neil Baldwin said: "This was an extremely challenging target which required defuelling rates to be significantly improved and sustained over a 12-month period. "The fact that the team was able to achieve that and safely deliver ahead of schedule is a testament to the dedication and professionalism of everyone involved." John Grierson, Chapelcross site director, said he was "very proud" of the speed and safety with which the operation had been carried out. Once fuel-free status has been verified work will continue on various decommissioning projects as the site aims to move to a "care and maintenance" phase in 2017. Mark Lesinski, of the Nuclear Decommissioning Agency, said: "This is a huge achievement for Chapelcross and for the decommissioning and clean-up programme in the UK. "I have been extremely impressed by the energy and commitment with which Magnox has risen to the challenge and I pay tribute to the workforce at Chapelcross."